If you are in business and trading with other businesses, known as B2B trading, then you really can’t afford to ignore LinkedIn. With over 260 million active users monthly worldwide, it is the number one B2B platform for building networks and connections and is the top-rated social network for lead generation. In fact, 79% of B2B marketers see LinkedIn as an effective source of lead generation with 80% of B2B leads coming from LinkedIn compare to 13% on Twitter and 7% on Twitter*. People may spend more time on Facebook but businesses invest more time on LinkedIn looking for content or connections that can help them solve problems. If you are not an active user of LinkedIn then your first step is to make sure your profile is top-notch and sends out all the right messages before you start posting content. 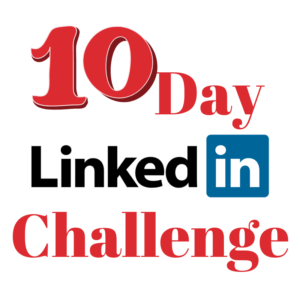 I’m setting a 10-Day LinkedIn Challenge to liven up your LinkedIn and make sure you are making the most of your profile. We’ll be looking at the top 10 things you need to do to improve your profile and ensure that it looks as professional as possible with plenty of practical suggestions and examples. Are you in?! Complete the form and your Challenge will be winging it’s way to you.